Image search results - "southwest"
SOUTHWEST_737-700_N294WN_LAX_0912B_JP_small.jpgIn'n Out burger parking lot works quite well for night action shots! southwest737N711HKLAS0207.jpgBeautiful late afternoon golden sunshine bathes this specially painted Southwest 737 in the retro colors with a distinct and rich gold/red (unlike the much more subdued regular old colors). Registration is also special; HK is the initials for Herb Kelleher, Southwest's now retired but still popular CEO. 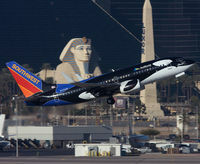 southwest737N372SWLAX1110.jpgJust short of a "night shot"
SOUTHWEST_737_LAS_1208i.jpgA killer whale flying past a Phoenix? -Only in Vegas!